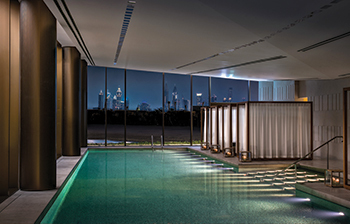 The Bulgari Resort Dubai even surpasses Bulgari’s own renowned standards. Resembing a seaside Italian village, it offers the solitude of an island escape and the residential feel of a private house. 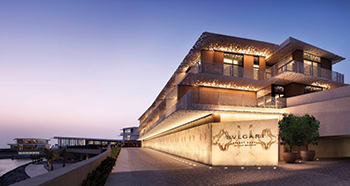 The Bulgari Resort Dubai, which opened doors to guests last December at Jumeirah Bay, is a first-of-its-kind development for Bulgari, both in terms of scale and magnitude. Designed to resemble a traditional seaside Italian village, the 1.4-million-sq-ft property comprises a resort, a necklace of six residential buildings with 173 sea-facing apartments, 15 private mansions, a beach club, and Bulgari’s first-ever marina and yacht club. While offering an opulent island getaway, it is connected to central Dubai by a 300-m bridge. “The Bulgari Resort Dubai is the destination of choice for visitors seeking the solitude of an island escape, the residential feeling of a private house, yet situated just minutes from the heart of the vibrant city and its cultural attractions,” says a spokesman for Meraas, a leading Dubai-based holding company and the property’s developer. The architecture and interior design of this striking landmark is the work of Italian architecture firm Antonio Citterio Patricia Viel, which holds credit for all the other four Bulgari resorts worldwide. The 540-sq-m Bulgari Villa ... features a large living area. 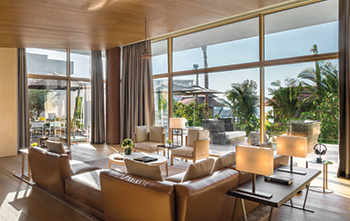 Split into four floors across two wings, the resort includes 101 hotel rooms and suites and 20 hotel villas, all exquisitely furnished with the highest quality Italian luxury furniture brands. Created on the overlay of horizontal lines, the building facades are defined by the lively shadow pattern of coral-like sunscreens reminiscent of the mashrabiyah used as shading in the Middle East. In interior areas, fine oak wood surfaces, with long and thin planks, recall the deck of a ship. Each room boasts large windows allowing guests to bathe in the light of Dubai’s long bright days, while black-out curtains allows them to shut out the light and recover from jet-lag in the perfect privacy of their personal sanctuary. Both the interiors and exteriors of the Bulgari Resort Dubai have been created with the same detail and precision given to a Bulgari jewel. Styled with illuminated gardens and pools, it blends Mediterranean landscaping with the natural surroundings of the shores of the Arabian Gulf. “Each high quality piece, from the marble bathtub to the sculpted door handle, is incorporated seamlessly with utmost discernment,” says the spokesman, adding it is the pure integration of an Italian soul, coupled with Bulgari’s superior approach to luxury. Warm, polished woods, rare, hand-selected marble, and superior textiles establish the property’s shining, pastel grandeur while the residential furniture in every room hails from Italy’s outstanding luxury brands – Maxalto, Fies, Flexform, B&B – each piece designed or chosen by Antonio Citterio Patricia Viel, and often tailor-made for the property. The finest quality of Arabescato marble for the external walls, Breccia medicea for the lobby, and Calacatta Viola for the La Galleria floors, were selected from the Italian city of Carrara. The rooms’ bathrooms are covered with ‘Trevi’ travertine from Tivoli that echoes Rome’s grandeur, while a scenographic ‘Portaro’ wall is the II Bar backdrop. Shanxi Black Granite from Mongolia covers most of the floors in the public areas while Imperial Green marble from Brazil enriches the walls of the boardroom. The 1,700-sq-m Bulgari Spa, which has eight treatment rooms and a 25-m indoor pool with a full sea view, has walls made of ‘Grey Vicenza’ stone. Its reception desk is made of precious Green Onyx from Iran cut with the ‘book matched’ technique that allows a near mirror image of its veins and peculiarities. Green Onyx is also used to clad one of the hammam walls while Afyon marble from Turkey takes centre stage in all the others parts of the room. The villas, with walls made of limestone from India, feature private pools made of rare ‘Green Sukabumi’ stone from Indonesia. Throughout the property, the repeated use of the custom-design ‘Moglia Pantheon’ mesh pattern recalls the ornamentation of the historic Roman Pantheon’s floor. The pattern features intricate bronze lattice-work, as well as Bulgari’s eight-pointed star motif, inspired by the Campidoglio floor in Rome. Iconic Bulgari photographs – often of vintage celebrities dating to La Dolce Vita, a 1960 Italian drama – are framed above the common areas while original jewellery sketches from the Bulgari archives are placed tastefully within rooms or in hallways, recalling the more-than-130 years of Roman jewellery design history. The indoor pool ... at the Bulgari Spa. The rooms and suites of the resort range from the 55-sq-m Superior Room to the 120-sq-m Bulgari Suite and boast expansive views over the breathtaking Dubai skyline or the Arabian Gulf, with large balconies to soak up the magnificent scenery. For guests looking for ultimate space and privacy, the resort’s five categories of villa enable families and friends to create a bespoke experience. Ranging from one to three bedrooms, with options to connect villas, the properties vary from 175 to 540 sq m in size, all with a private pool and gazebo. The 540-sq-m Bulgari Villa, one of the resort’s highlights, features a large living area, a sunken bathtub and a private lush garden with a large outdoor swimming pool. More Arabian-inspired than the other villas, the main living area, complete with floor-to-ceiling windows, has touches of the traditional Arabic majlis, including its warmer colour palette and textures. The Bulgari Villa is the only one offering guests a private indoor Jacuzzi, personal gym fitted with Technogym equipment and its own hammam. The Bulgari Resort Dubai features the 90-seat II Ristorante by Niko Romito, interpreting the exquisite flavours of Italy with modern simplicity. It is supported by II Bar, which has a 68-seat-capacity quintessential steel and bronze oval bar. Guests can enjoy a more casual dining experience at the larger II Café (172 seats), while the classically-designed 55-seat Lobby Lounge offers the residential atmosphere of a living room. The 360-sq-m Bulgari Ballroom located in the Yacht Club can be customised for large-scale events and offers state-of-the-art technology.